Part of Burlington College's Institute for Civic Engagement speaker series. 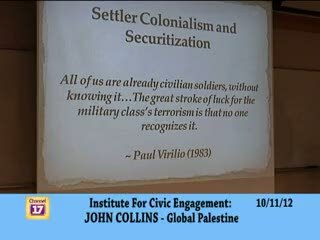 As an author and professor John Collins' work focuses on themes of globalization, nationalism, colonialism, violence, memory, political activism, and media criticism. John Collins is professor and chair of global studies at St. Lawrence University in New York. He is the author of Occupied By Memory: The Intifada Generation and The Palestinian State of Emergency and is co-editor, with Ross Glover, of Collateral Language: A User's Guide to America's New War. His articles and reviews have appeared in the Journal of Palestine Studies, Social Text, Globalization, and Middle East Report, among other publications. He holds a Ph.D. in comparative studies in discourse and society from the University of Minnesota, where he was a MacArthur Scholar.